In China, you could find many types of agricultural machinery, such as tractors, weeding machines, and harvesters etc. the materials of agricultural machinery parts include grey iron, ductile iron and cast steel. The main agricultural machinery parts include tractor gear box, iron bracket, reducer shell, belt pulley, cast iron cradle, iron support, brake drum, and axle support, etc. The main function of the gearbox is supporting the drive shafts to ensure that the distance between the center axis and parallel, and to ensure the correct installation of gearbox components with other parts. 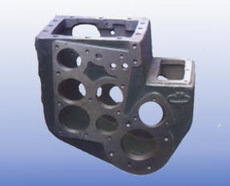 The material of tractor gear box is usually grey cast iron. Because the grey cast iron has good machinability, good wear resistance and vibration damping. Moreover, grey cast iron is cheaper. 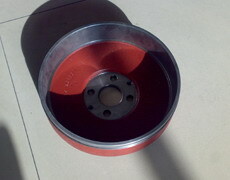 Brake drum is a part of brake system. The material of brake drums must have higher vibration resistance and wear resistance, so the material of brake drums is usually grey iron ASTM A48 Class 35. The type of axle support includes front axle support, and rear axle support The material of axle support includes grey iron, ductile iron or cast steel. Tractor axle supports are usually made by grey iron ASTM A48 class 20, 30 and 35. Auto axle supports are usually made by ductile iron ASTM A536 60-40-18, 65-45-12, 70-50-05 and 80-60-03. Gear casting is also called cast steel gear. It is because most of gears are made by cast steel. As for the materials, gear castings were usually made by high carbon cast steel, and some were made by alloy steel with some Cr, Ni and Mo in order to reach high tensile strength. 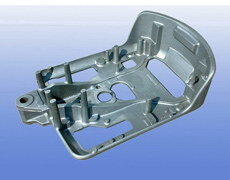 Cast iron brackets are usually made by ductile iron. Cast iron brackets are used on the trucks and vehicles, so they must have good tensile strength and elongation. Belt pulley mainly used for long-distance power transmission. Such as small diesel power output, tractor, agricultural vehicle, and mechanical processing equipments. The production processes of belt pulley are usually included casting and forging. 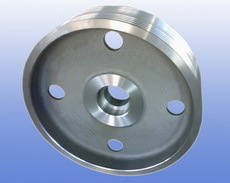 Large belt pulleys are usually made by casting process. The materials are usually cast iron. The followings are some cast iron farming machinery parts from Dandong Foundry in China.